Tucked in a corner of tropical paradise surrounded by hardened black rolling lava fields is Hale Hau’oli’, a towering artistic eco-villa Airbnb with a surreal view of the Kalapana lava flow. Designed to blend in harmony with the surrounding environment, Hale Hau’oli is off the grid powered by solar energy with collected rainwater that is UV and filter purified. The decor celebrates Hawaii’s laid back island vibe and outdoor living with rich warm shades of natural wood, colorful accents in bright blues, reds, and yellows and a nearly 360-degree view from every window. The second floor is Reminiscent of a treehouse jungle bungalow. Gazing out of the windows, tall papaya trees grow just outside with large fruit hang heavily from the slender trunk. The fruit is so close to the window, one could easily reach out the window to collect it for breakfast. The urge is easy to resist though because Sergei, the owner has already provided farm fresh eggs and a selection of fresh fruit from their tropical orchard. Sergei is a knowledgeable and friendly host. Offering advice on interesting places to see and things to do in the Pāhoa area. Hale Hau’oli’ is perfectly situated for those who want to hike the 1986 Kalapana lava flow trail. The hike is roughly 6 miles round trip from the end of the road to the lava viewing area. It is important to make note of the term “roughly” because lava is constantly moving and changing its path. Where it was viewable at some point in the past, may or may not be viewable in the same location this year. It is very important to check with the Hawaii Volcano National Park Service for current conditions. Safety should be of great concern when hiking the lava flow trail. Wear good sturdy hiking shoes with thick soles to protect from both the sharp edges of cooled lava as well as from the heat of underlying active lava. It is also highly recommended to have a couple bottles of water and a flashlight. There are no lights on the lava field and the black lava path is very difficult to distinguish in the dark. The path itself is not marked clearly and literally created from the lava breaking from other people’s footsteps. It can be difficult to see even during daylight. While in the Puna district, be sure to check out Uncle Robert’s Awa Bar and Farmers Market. This is Hawaii’s aloha at its finest and a unique under the radar experience. This farmers market is only open Wednesday evenings from 5 – 9 pm. It is a hotspot for the locals and anyone who wants to experience Hawaii in its purest form without the tourist influence. Vendors sell homemade baked goods, local produce, handcrafted jewelry, and local cuisine all while live music is being played on a small stage. The vibe of this nighttime farmers market is more of a bohemian folk festival. It is worth a spot on your itinerary. Driving directions to Uncle Robert’s – take Highway 130 South, drive to the end of the highway keeping the ocean to your front and you will find this hidden gem. Hawaii has one winery. Even if you are not a wine drinker this should be on your radar to visit while on the Puna side of the island. Volcano Winery not only creates a distinctive fruit forward wine they also grow their own black tea which they infuse in Macadamia Nut honey. This exclusive sweet wine has both the aroma and soft tea flavors. It is delightful extremely chilled and is only available on the Island. The Big Island of Hawaii is diverse and unique offering a wide range of activities for all interests. Whether you want to relax on the warm tropical beaches of the Kona side of the island or explore the towering fern forests and farmers markets on the cooler Hilo side. 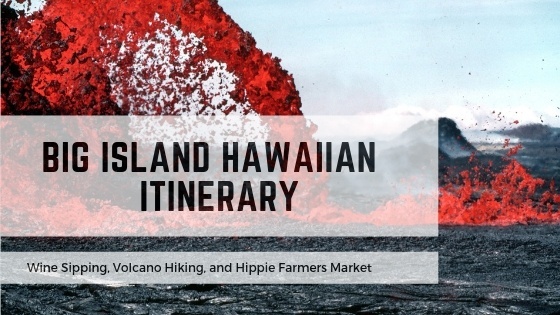 Regardless of what you do, no trip to Hawaii is complete without a visit to the Puna District to check out Kīlauea Volcano, Volcano Winery, and Uncle Roberts Awa Bar and Farmers Market. Thank you for reading this travel nugget of knowledge about exploring Hawaii’s Puna District and hiking the volcano. This article may contain an affiliate link or two, which does not affect you in any way, but will allow Empty Nestopia to continue to bring you travel tidbits. Thank you Mahima. I hope you have a great day. I loved your HI Big Island newsletter! Unique places and great tips! It makes me want to pack my suitcase tonight!! Thanks Kelli! I love Hawaii. Such a great place to relax, explore, thaw out, and take awesome pictures!